Free to Play Tank Mania, start your free game now (2016). Description: Pick your tank and destroy everything in your way as your drive to the finish line. 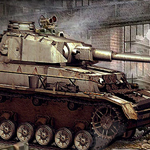 Some obstacles are extra difficult so be sure to blast them with your heavy duty tank gun!